This blog post was co-authored by Lauren Urbanek. Christmas came early for energy efficiency supporters this year with today's announcement that the U.S. Department of Energy (DOE) is formally adopting negotiated efficiency standards for commercial rooftop air conditioners, heat pumps, and warm air furnaces that together, represent the most energy and pollution savings under any energy-saving rule issued since the DOE standards program began in 1987. In fact, new equipment shipped over the next 30 years that complies with this standard will save 15 quadrillion BTUs (quads) of energy, which is nearly equivalent to the amount of energy in all of the coal burned to generate electricity in the United States in a year. That's huge. To put it in context, that's enough energy savings to offset the carbon emissions from more than 120 million U.S. homes for a year. Over the next 30 years, these standards will avoid more than 885 million metric tons of the carbon dioxide pollution fueling climate change while saving a net $50 billion in energy costs for the owners of the non-residential buildings - including giant retailers like Walmart and Home Depot - that use this equipment to heat and cool them. More than half of the commercial floor space in the United States is heated or cooled by these rooftop units, also known as RTUs. The standards adopted today resulted from months of negotiations between manufacturers, utilities, consumer and environmental groups (including NRDC) and other stakeholders. On the heels of the historic climate agreement reached in Paris, this new energy-saving rule shows just how much can be accomplished by working together to promote energy efficiency, the cleanest and cheapest way to cut carbon emissions from fossil fuel-fired electricity generation. Source: Creative Comments by P199. NRDC was an active participant in the rulemaking negotiations that built upon the success of DOE's innovative Rooftop Unit Challenge, an initiative launched in 2011 to urge U.S. manufacturers to deliver innovative, competitively-priced, energy-saving commercial air conditioners. Five companies now offer RTUs meeting the challenge's performance specification. As a member of the 17-member negotiated rulemaking working group, NRDC and other efficiency advocates worked to achieve significant energy savings, using a phased approach that gives industry more time to comply with the standards. The working group also agreed on previsions related to the test procedure for evaluating RTU efficiency savings and other provisions (described below) that will pave the way for long-term savings. Again, NRDC's efforts helped lead to the single largest rule ever issued by DOE, and it was developed with the full collaboration of industry players and efficiency advocates. That's the kind of progress that deserves celebration. What types of equipment are covered? The rule applies to the commercial air conditioners, heat pumps, and warm-air furnaces. This type of equipment can be comprised of standalone air conditioners or warm air furnaces, or units that combine both heating and cooling. 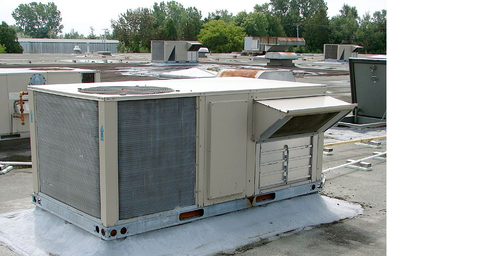 Rooftop units covered by these standards vary dramatically in size, from a small system with a cooling capacity of 65,000 Btu per hour, up to very large units that have a cooling capacity of 760,000 Btu per hour. There are approximately 290,000 units shipped each year. For comparison, a typical residential air conditioner used by a single-family home has a capacity on the order of 36,000 Btu per hour. The energy consumption avoided will cumulatively reduce commercial customers' net utility bills by nearly $50 billion over the life of the standards - a savings that's equivalent to the annual economic output of Costa Rica. That's real money that will help reduce operating costs and benefit a company's bottom line. Because this standard covers such a wide range of product types, there is an equally wide range of savings for any individual commercial facility. For instance, a small commercial building with a 90,000 Btu/hour (7.5 ton) unit could expect to save about 3,000 kilowatt-hours of electricity each year compared to today's least efficient model, which would translate to around $6,000 in utility bill savings over the life of the unit. How does the rule work? 2018: New air conditioner and heat pump RTUs manufactured beginning January 1, 2018, must be 10 percent more efficient than products available today. Efficiency levels required in 2018 are equivalent to the levels currently published in ASHRAE 90.1-2013, which is the national model building code that covers this equipment. 2023: RTUs manufactured starting January 1, 2023, will need to meet even more stringent IEER requirements, making them approximately 25 to 30 percent more efficient than today's models. The new standard applies to both natural gas-fired and oil-fired commercial warm air furnaces. By January 1, 2023, gas-fired commercial furnaces must have a thermal efficiency of at least 81 percent, and oil-fired furnaces must have a thermal efficiency of at least 82 percent. The agreement also includes direction for DOE to update the procedure for testing the energy efficiency of air conditioners and heat pumps, with the goal of better representing the total energy use of the fan - a major contributor to RTU energy use. This will be handled through a rulemaking that will begin in early 2016, with a final test procedure rule to be issued no later than January 1, 2019. DOE implements efficiency standards for more than 60 categories of equipment and appliances. Improved standards mean lower utility bills and more savings for the consumers who purchase covered equipment but can't tell from the outside if it's unnecessarily gobbling energy. As of this time last year, DOE had finalized seven efficiency standards. This year, however, has largely been spent working with industry, efficiency advocates, and other stakeholders to negotiate standards for six product categories, demonstrating the agency's commitment to a transparent stakeholder process that achieves meaningful energy, water, and consumer savings. The outstanding accomplishments of the energy efficiency standards program proves that it's not only possible for industry and advocates to work together toward a common goal, but that collaboration can produce better results for everyone involved.